Injectables don’t disrupt a household’s daily routine, thereby protecting the human-animal bond. Clients know their pet is receiving the full course of treatment — with no pressure for them to remember to give daily doses. See how it supports healthy patients, healthy clinics. 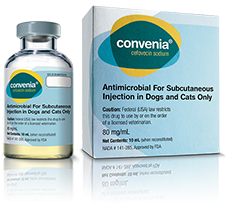 * In a U.S. efficacy study, only 14% of dogs treated for skin infections required a second injection. † In clinical studies, a single injection of CONVENIA was clinically equivalent to a 14-day antibiotic regimen.